I don’t have a season ticket and tickets are fairly hard to come by at White Hart Lane so I don’t go to that many games. However, this year I am making a concerted effort to go more often and this was my second game of the season. 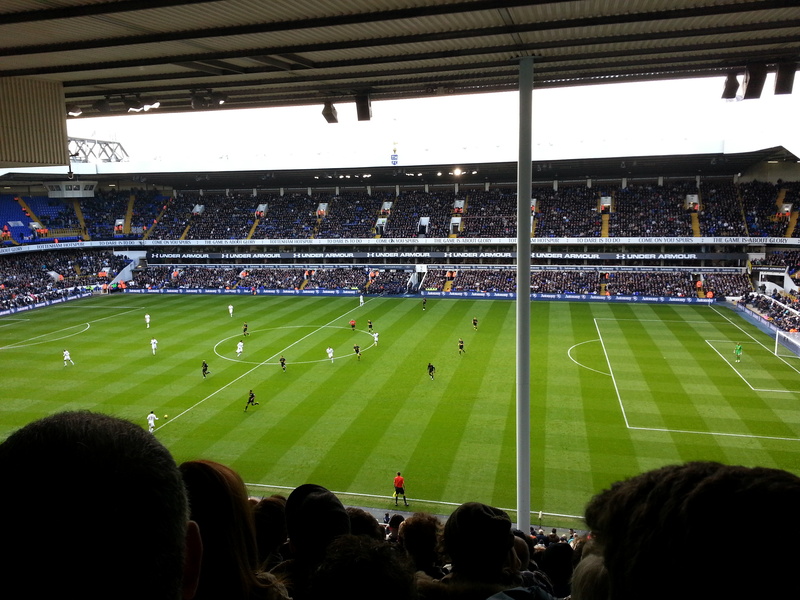 I took along a friend who had never been to White Hart Lane before. He goes to a lot of England matches, so I assured him he’d see a much better game than he was used to. As it turned out the way Spurs played was very much like some of the more turgid England displays. In fact I can’t remember quite so disappointing a Spurs performance. At least with Spurs, games are not normally dull. We may lose but we lose in style; well not this time. I don’t think there’s anything more disappointing when you are actually at a match than when your team does not even manage to score a goal. At least if they score you get one moment of celebration, one moment of release that maybe justifies the inflated ticket price. So losing one nil is perhaps the most disappointing way to lose. Anyway, back to the game. Wigan played a high pitch pressing game, similar to Barcelona (yes I realise that comparing Barcelona and Wigan sounds incongruous). It worked perfectly. Spurs, shorn of Dembele and (after an early injury) Sandro had no dynamism in the centre of midfield. They were slow and ponderous. There was no movement, no invention, no urgency. Never has it been more obvious how much we miss Modric. Continuously they would play it out from the goalkeeper, pass it around at the back a bit, then run out of options. The ball would invariably end up with Gallas who would then pass it back to Friedel. Unsurprisingly this did not please the Tottenham supporters who made their displeasure known to Gallas, but it wasn’t really his fault. We weren’t giving him any options in midfield. This lack of movement was epitomised by the performance of Huddlestone. Now, I like Huddlestone and I’d always hoped he would make it at Spurs. He seems like a nice guy and he can strike the ball as well as any player I have seen. He’s been on the fringes of the first team for a while now and the jury is still out on him. For me this game has proved he isn’t the future. He is just too slow and ponderous for Premier League football. It used to be said that Sheringham had an extra yard in his head; well Huddlestone loses one. We had a lot of the ball but did virtually nothing with it. Wigan pressed us well and this was at least part of the reason for our poor performance. When Wigan had the ball they looked dangerous. Incisive quick passes and movement showing us exactly what we were missing. Wigan are a strange team. A look at their results at the end of last season will show just how good they can be, but their flirtation with relegation points to their inability to produce this form consistently. Well this was certainly one of their better performances. Not everything about Wigan was positive though. One thing that you didn’t see if you watched this game on Match of the Day was the constant time wasting they employed which began even before their goal. The goalkeeper would take his time at goalkicks, players would stay down when clearly not badly injured, all the usual tricks. One particular ruse they employed was for nobody to go to take a throw in. They would then all look at each other as if this had been a mistake and finally someone would go over and take it. This seems like a particularly clever trick as who could the referee book? I don’t want to come over all Alex Ferguson, but bearing in mind there was a long stoppage for a legitimate Wigan injury it was scandalous there were only five minutes of injury time. As the game wore on we started improving slightly. Wigan got tired and dropped back more, defending their lead. Bringing on Adebayor helped. This was roundly booed by the Spurs supporters as Defoe was taken off. Defoe is very popular and his ability to pop up and score from nowhere is useful when you are behind. However, he was contributing nothing to the game mainly because we could not get the ball to him. Defoe gives you a lot but he does not give you an out ball and he does not hold the ball up. With our problems in midfield the ability of Adebayor to provide these was priceless. Having said that, despite having a few chances near the end of the game we still did not look like scoring, and Wigan were good value for their victory. This entry was posted in Match Reports and tagged coys, football, Spurs, thfc, Tottenham, Tottenham Hotspur, Wigan on November 7, 2012 by Jon @ AnythingButPenalties.